Here on Earth, we take for granted that when we pour water into a glass, the water will flow downwards and then stay inside the glass until we want to drink from it. The water goes into the glass and stays there thanks to the force of gravity. Imagine how frustrating it would be if the water just floated away or tried to crawl up the sides of the glass after you put it in there! That’s what happens in the microgravity environment of the International Space Station (ISS). Because there’s no gravity to hold liquids in position, astronauts have only the force of surface tension to control the behaviour of liquid in space. That’s why liquids on the ISS are usually contained in a sealed bag and drunk through a straw. Cold drinks through a straw may be fine, but if you have ever tried to drink a hot drink through a straw, you’ll know it just doesn’t taste as good as when you drink it from a cup. Luckily for Tim, six specially shaped cups have been designed for the ISS. The cups are open at the top like ordinary cups, but their structure is designed to make use of the surface tension of liquid. So Tim he will be able to have a cup of tea and drink it in ‘almost’ the usual way. Another simple pleasure that astronauts don’t have is crying. Again, you may not think this is really a problem because it’s not a pleasure to cry! The problem is that astronauts can still feel like crying, or they could get something in their eye that causes the tear ducts to produce liquid, but because there is no gravity, the tears just stick to the surface of the eyeball. So they cry, but their tears don’t fall, so they have to use physical force to wipe them away. It can be a bit of a nuisance if your hands aren’t free! An astronaut with a huge amount of ‘tears’ stuck on his face! On the ISS, in microgravity, the force of surface tension is the only force that affects the behaviour of liquids so scientists have to work with that to achieve the kind of results we’re used to on Earth. Here are two cool experiments you can try to see the surface tension of liquids in action. Surface tension doesn’t seem such a remarkable force when it’s working alongside gravity, but if you look carefully, you can see it working hard. Use the card to make your rocket. It can be as simple as you like; a two-dimensional rocket is fine, or you can fold it into a more intricate design. It helps to decide which is the front and which is the back. Place it on top of the water. Now dip the cotton bud in washing-up liquid and then dip it into the water just behind the boat. The boat shoots forward, powered by the movement of the surface tension of the water being broken. Put the plate on a level surface. Pour some milk on to the plate. 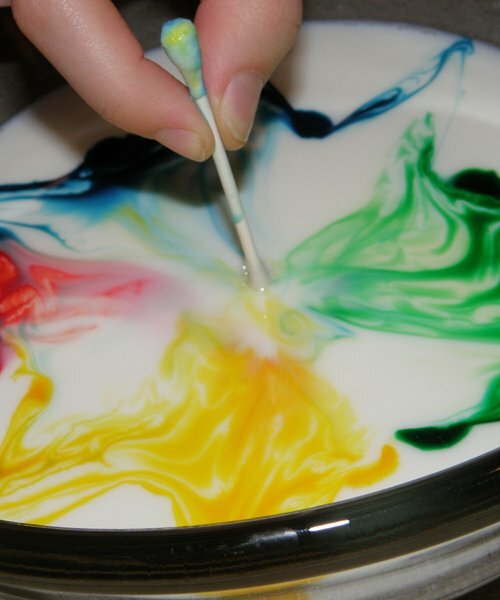 Drop a little food colouring right into the centre of the milk, but don’t be tempted to stir or mix it. The more different colours, you have the more colourful the results. 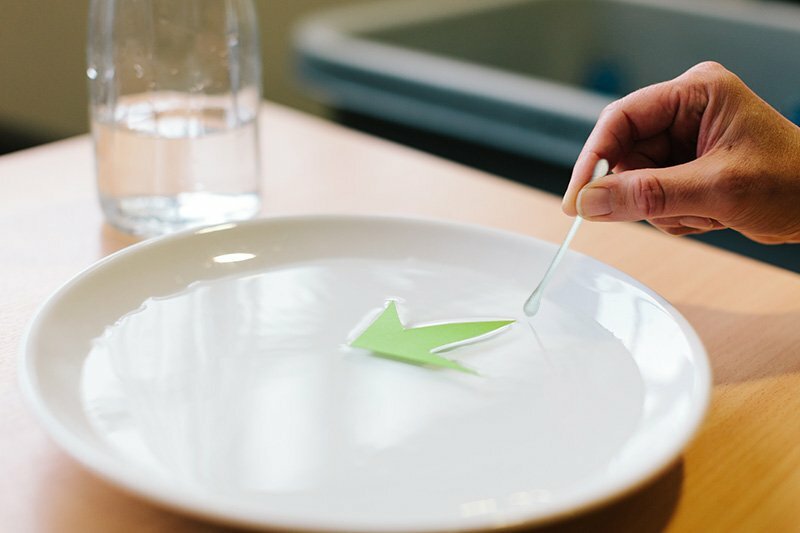 Now put a tiny amount of washing-up liquid on one end of the cotton bud and then hold the soapy end of the cotton bud into the food colouring. The surface tension of the milk holds the food colouring in place. When you dip the soap into it, the tension is released and the food colourings disperse, creating incredible moving patterns. © 2019 Destination Space. All rights reserved unless stated. Main image on this page copyright NASA and used with permission as stated.